I went to my account and tried to cancel it but the button doesn't work. It's not supposed to, it just changes your status at the top to "Canceled." @myskaros lol you cancelled your membership to prove your point? 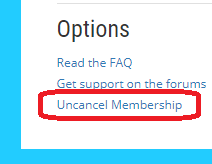 Are you able to uncancel it just as easily? 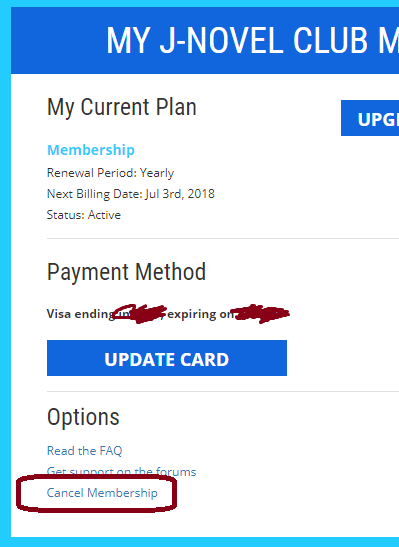 It's pretty nice, since it really doesn't matter what the status of your membership is until your billing date, so why not allow you to toggle it as much as you want. Ya that doesn't happen with mine it doesn't update anything and my button does not change to uncancel membership. Aaaaaand it magically worked. Thanks guys! Tried cancelling membership it, does not work, they keep billing me every damn month even though I don’t read J Novel books and only bought 3 ebooks from them ! @cheap88 E-mail support@j-novel.club. They can sort you out.